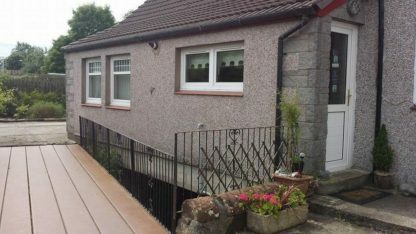 The Old Smiddy Cottage and Apartment is a semi-detached holiday home with a garden, located in Balloch in the Strathclyde Region. It provides free private parking. Free WiFi is offered throughout the properties. The two-bedroom house is accessed across a small stream which runs through the house. The cottage-style property offers a well equipped kitchen, and a lounge with a working fireplace. The two-bedroom apartment also offers a well equipped kitchen, and retains much of the old character of the original Blacksmith's house. Both properties offer a flat-screen TV, a selection of books, and en suite bathrooms. The Old Smiddy Cottage is just a 15-minute walk from Balloch train station, and guests are a mile from the beginning of Loch Lomond and a selection of water sports and activities. Luss Pier can be reached within 35 minutes via public transport. Glasgow is 21 miles from The Old Smiddy Cottage and Apartment, while Stirling is 29 miles from the property. The nearest airport is Glasgow Airport, which is a 25-minute drive from the property.